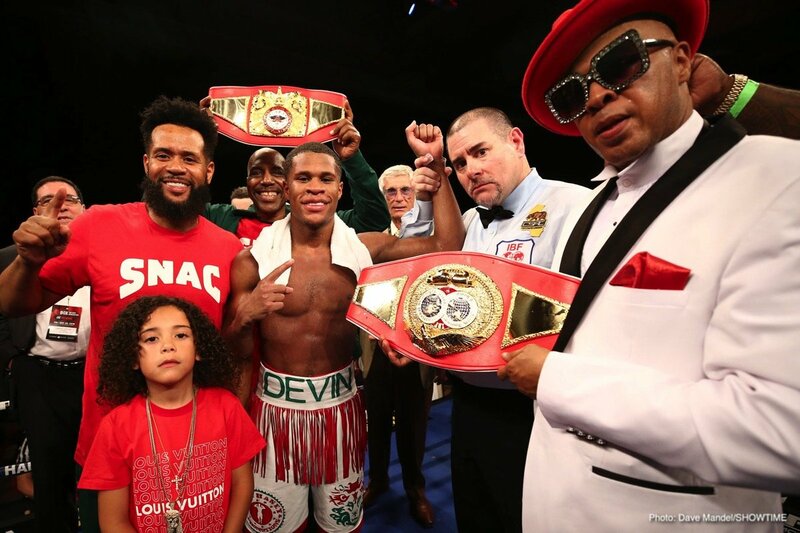 Top lightweight prospect Devin Haney will face fellow-undefeated Xolisani Ndongeni in the first ShoBox: The New Generation telecast of 2019 on Friday, January 11 live on SHOWTIME at 10 p.m. ET/PT from StageWorks of Louisiana in Shreveport. The 20-year-old Haney (20-0, 13 KOs) returns in a 10-round bout for his third consecutive test on the prospect developmental series having barely lost a round while his level of opposition has strengthened over the last two fights. The fast-rising prospect will face just his second undefeated opponent in South Africa’s Ndongeni (25-0, 13 KOs), an unbeaten 28-year-old who once held the IBO’s belt at 135 pounds. In the co-feature, two-time National Golden Gloves Amateur Champion and highly touted Californian prospect Ruben Villa (14-0, 5 KOs) will take on hard-hitting former Puerto Rican amateur champion Carlos Vidal (14-0, 13 KOs) in an eight-round featherweight bout. The opening bout of the tripleheader will feature undefeated Cuban heavyweight Frank Sanchez Faure (10-0, 8 KOs) against an opponent to be announced. Haney has been considered one of boxing’s top prospects since turning professional at the age of 17 in Mexico in 2015. In his last fight on Sept. 28 on ShoBox, Haney won via near-shutdown decision of three-time world title challenger Juan Carlos Burgos, handing the veteran his first loss since dropping a decision to Mikey Garcia in 2014. Haney grew up in Oakland and fights out of Las Vegas, where he has earned a reputation as a prodigy having sparred with Floyd Mayweather, Shawn Porter and Jessie Vargas. The flashy and outspoken 20-year-old is now ranked in the top 15 of three of the four major sanctioning bodies (No. 8 WBA, No. 10 IBF, No. 11 WBC) after just 20 professional fights. Ndongeni has rallied off 25 straight victories since turning professional in 2010 while campaigning largely in South Africa. His lone start outside of his hometown came in 2016 in California, where he handed previously once-beaten Juan Garcia Mendez the second loss of his career. Ndongeni, who has nine scheduled 12 round fights on his resume, has been ranked as high as No. 3 by the WBA and owns a victory over former 130-pound world champion Mzonke Fana. He has won a number of regional titles and claimed the IBO’s vacant 135-pound title via ninth round knockout in 2015. The 21-year-old Villa started boxing when he was just 5 years old and compiled an impressive 166-17 record as an amateur. The Salinas, Calif., native was a two-time Junior Olympic National Champion and the 2014 and 2015 National Golden Gloves Champion. He owns two wins over eventual Olympic Silver Medalist Shakur Stevenson as an amateur before losing to his rival twice in the 2016 Olympic Trials. Villa turned professional in 2016 shortly after the Olympic Trials and has registered 14 professional victories in just over 24 months. The southpaw will face his toughest test to date and just his second undefeated opponent in Vidal on January 11. Vidal was a two-time Puerto Rican National Champion with an amateur record of 104 wins against just 10 losses. The 29-year-old is a strong power-puncher with 13 KOs in 14 professional fights, with all 13 coming inside of three rounds. Villa, who lives and in trains in Las Vegas, will be making just his second start in the United States against his first undefeated opponent. The 26-year-old Faure fought on the Cuban National Team and competed in more than 200 amateur fights. After defecting from Cuba, the heavyweight turned professional in September of 2017 and has won 10 fights in just over 14 months. Faure lives and trains in Las Vegas, where he is managed by International Boxing Hall of Fame referee Richard Steele. Previous boxing news: Tevin Farmer battles Francisco Fonseca on Canelo-Fielding card on DAZN this Sat.